With All of the Fixins. No like vendor offers the technology & expertise like Newton Animations. Newton Animations offers the broadest range of advanced photo & video booth technologies for truly spectacular & memorable guest experiences.From augmented reality to light painting we offer it all. More important we are also graphics designers, 3D animation specialists and gaming developers. We can literally do almost anything. Lastly, we offer video monitors of all sizes, amazing on-site print functionality including video flip books and social sharing. It is our range of technologies and specific expertise that sets us apart from any like vendor. Call us 7 days a week at 781-708-1255. We only use photo & video booths made by FOTOMASTER. THEY ARE AWESOME!!! Guests stand in front of our 7′ by 10′ monitor and chose from virtual three-dimensional assets (ready made or custom built for your event) that are affixed to the head, eyes or hands using iKinect technology. The iKinect technology also allows a virtual green screen background meaning we can insert any kind of background (picture or video) behind your guests. Guests record their video, take a snapshot picture or we can produce video flip books of their experience on the spot. This is hands down the best experience we offer. Guests stand in front of our 7′ by 10′ monitor and take a picture. Using infrared light beam (via spray paint type cans). The software converts the light beam into virtual images for wonderful overlays…or literally acts like a can of spray paint. Guests chose from any color. They can resize, rotate, move or recolor. It is jaw dropping cool technology. Our 3D Video Booth allows guests to stand in front of a green screen. The technology inserts them into any background you chose (picture or video) with pre-made or custom three-dimensional objects in front of them. The experience is captured via video that can be shared on the spot. We have the technology to print, assemble and produce mini video flip books on the spot. These are great take home keepsakes. Everything can be branded with your name, brand, message and/or logo. Our Air Graffiti Touch Photo/Video Booth is a first cousin of our Air Graffiti Spray Booth above. The technologies, workflows and uses are literally identical except this system uses touch technology instead of a spray paint can. However, instead of employing our 7′ by 10′ projection monitor we provide a custom 55 inch monitor that sits atop a sleek Star Trek style stand (other monitor set-ups available). aka Light Painting. 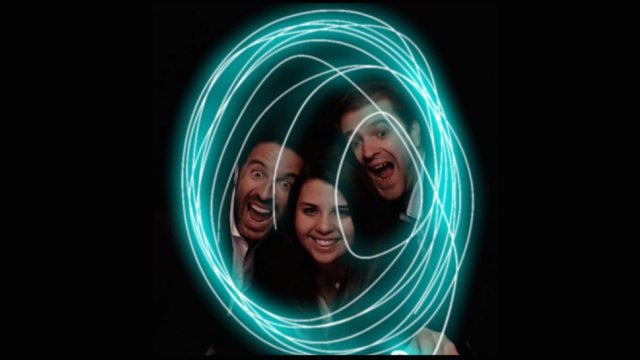 Guests stand in front of a black backdrop (or our portable enclosed photo booth structure) and using a simple hand held light create fun drawings in the color of their choice. The entire experience is recorded on video. We can insert any object into the foreground (2d/3D). These are very fun to assemple into a video flip book for a fun and branded take home keepsake. Remember not only do we offer advanced photo and video booth technologies, we offer the design and development expertise to truly customize the experience. Other vendors may offer simple overlays branded for your event. We of course do that as well but take it one step further. We can built assets and experiences into the core system. There is not one like vendor in all of New England that can offer the same. Please give us a call if you are interested in advanced photo/video booth technologies for your next party or event. We can be reached 7 days a week at 781-708-1255.